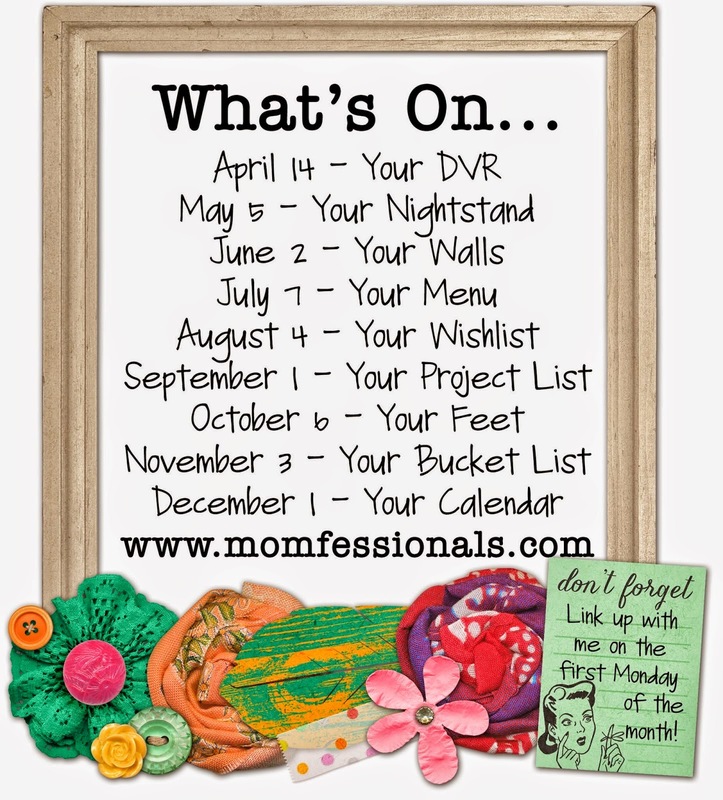 Today I'm linking up with my girl, Andrea, to show you "What's On...My Walls". We've almost lived in this house a year and I STILL have bare spots on my wall. So, I'm hoping I get some GREAT ideas from this link-up. You'll see that my go-to item for walls is pictures! This picture is hanging in Bowen's room above his crib. I shared all of Bowen's room in a post here. This chalkboard is in our kitchen. I found it at Home Goods for a GREAT price! A big canvas from last fall's photo session is above the mantle. Did you guys do this at your wedding?? It was really popular when we got married (in 2005). We have this hanging in a little hall that leads to our bedroom. Family picture from 2011 is above the buffet in the dining room. This is above the wall on the other side of the dining room. This sweet sign was from friends for Ebby Lee's baby shower. Her dresser is right under the sign. This is on another wall. When I was pregnant, Marla bought this for E's nursery. Bow holders are also in her room! I bought these vinyl circles off Etsy. They were WAY easier than painting circles!! Amazing vintage football canvases were done by Marla for Nixon's room. I found these online, but they were WAY out of my budget. Marla took one look and that she could do it! She is FABULOUS!! He has a little collage of football stuff and varsity letters with his initials on another wall. Another picture from the family photo shoot in 2011. Sweet sweet picture of E as a baby is in our room. This big lit up "B" hangs on a shelf in Bowen's room. I love it! I'm looking forward to getting some new ideas for my bare walls!! You say you have blank spots but I never see any! I always see lots of great pics of your sweet family :). I love the portrait above B's bed the most...seriously such a cute picture of your three kiddos! All of them are sweet! Love the fun stuff on your walls! We totally have the wedding signature guest matte just like yours! Love all your family photos. I love this!! You have done such an incredible job of filling your walls in just 1 year!! Your post has shamed me. Sooooo many great pictures of you and your sweet family!!!!!!! Beautiful family pictures! I love the "B" that's lit up in Bowen's room! Super cute! LOVE the big canvas above your mantel and the one where Ebby Lee is sitting on a suitcase. Precious!!! Thanks so much for linking up! All the family photos are beautiful! We need some big family photos on our walls! You have such pretty frames!! oh I love it.. I love all the family pics so darling! I love the vinyl circles.. I need to do that, I have the silhouette cameo, and barely ever turn it on LOL! We have a signed matte too, but ours is from our rehearsal dinner. You'll see it if I ever get around to this post today! Girl, I am right there with you on having blank spots. At least you have some BEAUTIFUL family photos! Ebby Lee's eyes as a baby are breathtaking! I totally remember the signed photo matte from weddings around that year. Love all your pictures. but I MUST know...where did you get that lighted B? I need a J! I have found solid metal ones but I have yet to find a lighted one! I am in LOVE! :) You have a beautiful family! Jamie...I got it at the Canton Flea Market in TX. They have a variety of things...tons of new stuff. I was prepared to try to DIY it. I googled and found a blog post explaining how. Mine is wood though...not metal. Hope this helps! !